The Original Rain Slicker™ is highly versatile and great for cool, windy and wet spring to fall days. The outer shell offers full water and wind protection by using high quality coated nylon. For long haired breeds who need a little extra protection during the cold winter months, this coat is ideal and helps reduce that wet doggy smell during the rainy season! 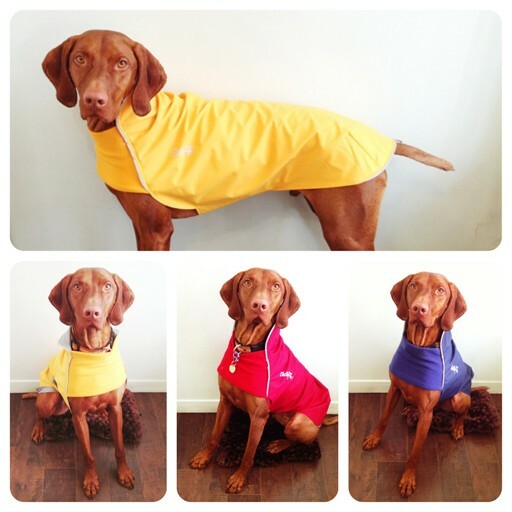 The extended collar can be worn up for more rain and wind protection or down for flare. - Skillfully designed and manufactured here in Ottawa, Canada using Canadian materials. - 100% wind and waterproof 200 Denier polyurethane coated nylon outer shell. - Soft micro fleece is used across the chest for mobility and comfort. - 3M Scotchlite™ reflective piping around the neck and rear for night visibility and safety. - The lining fabric is a soft and comfortable polyester featuring a turn down collar. - Wide strips of Velcro© are used to fasten the wide belly panel to the body of the coat. This ensures a secure fit. (All Breed and L&L coats only) - Adjustable nylon webbing and a smooth shaped buckle system is used to securely fasten the coat around the body of the dog. (Whippet coats only) - 3M Scotchlite™ reflective loop at the rear of the coat for hanging/storage purposes. This loop is not for the tail!